While merit can be found in questioning unrestricted, free trade, Trump's current policy is unjustified. The ugly rivalry with China over global leadership lies at its heart. Like many US presidents before him, Donald Trump has taken issue with the unbalanced trade between his nation and the rest of the world. Over the past decades the US has developed a sustained trade deficit which currently stands at around 2.5% of GDP. Two thirds of the deficit stem from trade with China, which has disrupted industry in the US and led to de-industrialisation of large parts of the US economy. Economic arguments for whether or not this has been a good development run both ways. (Donald Trump certainly made up his mind about it, as evidenced by his imposition of tariffs, directly aiming at China, and had indeed been his key promise during the election campaign.) Even if more managed trade is desirable, Trump’s trade policy is not justified. However, the more important issue is not whether to build ‘trade walls’ or not, but rather who has leadership at the helm of the world economy. The argument for unrestricted, free trade builds on strong assumptions and restricting free trade can be justified in their absence. The current regime of largely free trade builds on the understanding that goods produced under competitive conditions are to compete freely in the world market. Trade deficits therefore imply that domestic industries are simply not competitive enough and countries are themselves to blame for ‘missing the boat’ and lagging behind economically. Both these arguments have repeatedly been criticised on the ground that many goods are not produced under competitive conditions because often the prices of goods do not reflect their true costs (both socially and environmentally). Similarly, countries with persistent trade surpluses (think China but much more so Germany whose current account surplus is around 8% of GDP) have been called upon to adjust upwards their real exchange rate to allow everybody to balance their books. Dumping via lowering either prices or the exchange rate violates the assumptions underlying many of the arguments for free trade. In this sense, one can make an argument for why corrective policy measures geared at the trade in specific goods are needed, thus providing a theoretical justification for managed trade and US policy action. However, when the US administration imposed its tariffs, it did not use the above-mentioned arguments. Instead, it invoked a clause which permits unilateral action for ‘national security’ reasons. In doing so, it hopes to circumvent the dispute settlement mechanism of the WTO where it would have to argue how exactly China is violating its commitment to WTO obligations. It remains to be seen whether such a strategy will be successful. It certainly leads to a side-stepping of international law and hollowing-out of institutions which up to now have provided at least some form of multilateral governance of global trade. This lack of interest in multilateral cooperation can also be seen in the US administration’s ‘America First’ slogan. This rhetoric suggests that the US now believes trade to be a ‘zero-sum game’: if one gains from it, somebody else necessarily loses. US restrictions on free trade for the wrong reasons are troubling enough. However, the even bigger issue is the country’s rivalry with China over global leadership could have more severe consequences. US trade policy under Mr Trump represents a shift from the long-running understanding that the US acts as a stabilising force in the world economy. In this role, the US has for a long time borne much of the brunt of an unbalanced free trade regime because it was convinced that free trade is a ‘positive sum game’ in which the efficiency and innovation that free markets create benefit all, despite the fact that some benefit more than others. Charles Kindleberger, in 1973, argued in his book The World in Depression, 1929-1939 that the world economy needs a hegemonic leader to ensure stability and prosperity. A century ago the British Empire fulfilled this role but as it declined the world was left without a nation willing to shepherd the global community into the safety of cooperation, putting the common good and cooperation before direct and immediate national interests. The US as an ascending power was reluctant to take on this role and this is, Kindleberger argues, what made the Great Depression great. While trade barriers and the threat of a trade war are serious matters, the more important issues over the coming years will be whether the US is still able and willing to fulfil its stabilising role in the world economy. Announced trade sanctions against China are less about the trade deficit and steel dumped on US markets than about protection of high-tech industries in which China is aiming to become world leader. The continued ascendency of China in economic terms seems inevitable (given its sheer size even in case of a Japanese-style levelling off in income growth) and its projection of power has been causing concerns in the region for a prolonged period of time. Global leadership shifted over the North Atlantic 80 years ago, and the important question is how it will shift over another ocean. 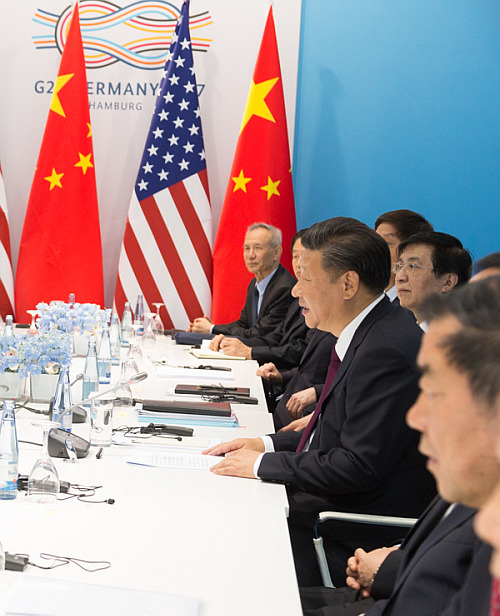 Ideally, China and the US would both take on a stabilising role or cede their hegemony to a supra-national body, thereby establishing a truly global form of governance. A more likely scenario, however, is a protracted struggle for supremacy in which neither power has a decisive edge over the other. This is where things usually get ugly.